The Merge Storyboard dialog box lets you reassemble a storyboard project that was split or extracted into several files. By merging several projects into one, you can have one final Storyboard Pro project. Displays the list of Storyboard Pro projects selected for merging into your current project. Allows you to browse for and select a Storyboard Pro project to add to the list of projects to merge. Removes the selected project from the list of projects to merge. Moves the selected project up in the list of projects to merge. Moves the selected project down in the list of projects to merge. Allows you to make sure the caption fields in the projects being merged are properly matched with the caption fields in your project. The left column is for the caption fields of your current project. They cannot be modified from this dialog. The other columns are for the caption fields of the projects getting merged. If a caption field of one of the project being merged is aligned with one of the caption fields in the current project, the values for that merged project's field will be added to the current project's field it is aligned with, for all the scenes that are imported from that merged project, even if these fields don't have the same name. 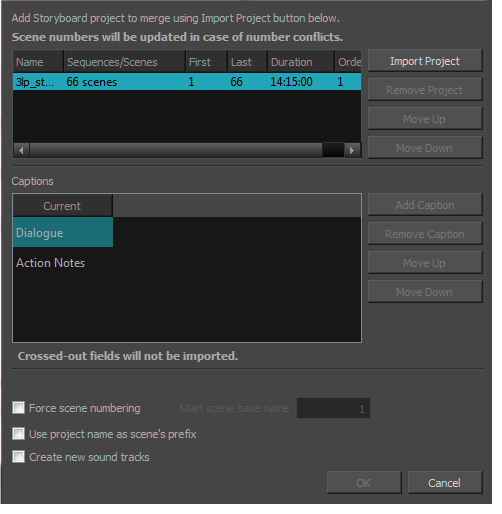 For example, if the current project has a caption field named Action and the project being merged has a caption field named Action Notes, and they are both aligned horizontally, once the projects are merged, the value of the Action Notes caption field for the scenes being imported will be stored in the Action field. If a caption field for the project getting merged is below all the fields in the current project, it will be added as a new field to the current project. If a caption field for the project getting merged is below all the fields in the current project and is crossed out, it will be ignored. If a caption field for the project getting merged is aligned with one of the fields of the current project and is crossed out, this field will be empty for all the scenes that are imported from that project. If a caption field is added to the project but has the same name as an existing caption field, it will have a suffix number. If you have removed a caption from one of the projects getting imported, you can select the removed caption and click on this button to add it back. Ignores the currently selected caption field for the project it is under. The values for that caption field and project will not be imported in the current project. Moves the selected caption field up in the list of captions, changing which caption field in the original project it is matched with. Moves the selected caption down in the list of captions, changing which caption field in the original project it is matched with. By default, if any scene being merged to the current project has the same name as a scene that is already in the project, it will have a suffix letter added to it. With this option enabled, all scenes in the project will be re-numbered sequentially. If the Force scene numbering option is selected, enter a number in this field. The number you enter will be assigned to the first scene in the resulting project. Scenes that are added to the current project from other projects will have their project name as a suffix, so you can easily identify which projects they came from and to avoid naming conflicts. Imports the audio tracks from the other projects by adding them as new audio tracks to the current project. If this option is unchecked, the sound clips of other projects will be inserted in the current project's existing audio tracks and new audio tracks will only be created if the merged projects have more audio tracks than the current project.